As this site is relatively new, I will be adding blog posts as time progresses. At a future date I plan to open the blogs up for comments and discussion. If you'd like to respond, please contact me with your comments and I'll add them to the posts. Thanks! It was in the month of Dec, the year of 2014 when I fully committed to becoming a CRNA traveler. I had traveled before, but this was different. This time I would travel for the sole purpose of traveling. Travel would be my end game, not just a means to an end. I knew there would be tough times and I would need to have a good reason for pursuing this path. Trust me when I say, money alone doesn’t cut it. Money comes and goes, we spend what we make, and then the more we make the more we spend. So I came up with a better reason; Independence. I make my own choices. I will not be ruled by any one institution’s internal politics. I travel because it gives me the freedom to make the best choices for me. And I take full responsibility for the good, as well as the not so good choices I make. 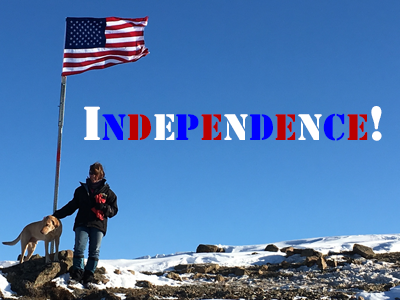 Over the past five years I have accomplished the goal of being independent of any one institution. Now, my goal is to, as much as possible, become independent of staffing agencies. One of the advantages of travel is the time off between assignments. It provides time to regroup, contemplate and move forward towards living the life you dreamed. During this break I decided to take my time heading back to Alaska. I have to take my truck back, so I have to drive. I figure I would stop by to see a good friend in Denver and then again in Seattle. I’m hoping the snow and inclement weather will be gone by the time I get to Canada. My husband says “just put the chains on, when the roads get bad.” Me? Putting chains on? In the cold? By myself? I don’t see that happening. But then again I was planning on hiking the Appalachian Trail alone. So maybe, in his eyes, it’s not that different. Luckily my husband, being the man he is, caved in. and said he would come with me on the stretch from Seattle to Anchorage. So there it is. Bax and I are off to Alaska! Wish us luck. Stay tuned. As with all life’s choices, travel has its ups and downs. Recently, I’ve experienced the down sides of travel. Oddly, depending on how I looked at it, it could be viewed as an upside as well. Let me explain. In November of 2018 I made plans to travel to Columbus, Georgia and arrive by March 2019. 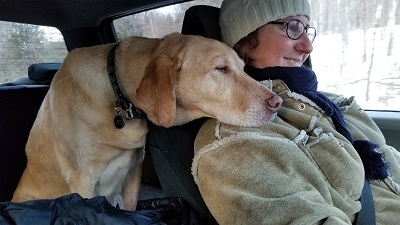 My husband planned to fly down from Anchorage to New England (where I was on assignment at Dartmouth-Hitchcock in Lebanon, NH) and drive together with me and my dog, Bax, south to Georgia. It would be springtime and I had heard Georgia is beautiful in the spring. I figured since I don’t have any allergies to pollen, I should be good. I also have some very good friends who live near Atlanta. I could spend my off time visiting them and learning more about the state. Unfortunately, due to the mishandling of paperwork on staffing agency's end, the Georgia BON decided to hold up my RN licensing, making it impossible to reach the deadline for credentialing. Because of the delay, NorthStar/Columbus, GA decided to cancel my assignment altogether. Usually staffing agencies postpone the start date rather than cancel, so this was a surprise. The staffing agency I was working with at the time, suggested I go to Derry NH, since I already have my license in New Hampshire. However, even if everything were to go smoothly, it was already late to start credentialing and I would most likely be out of work for several weeks. I told StaffCare I would do it. But then, three weeks later, my staffing agency told me they neglected to submit my CV to the Derry facility and that assignment fell through. My assignment at Dartmouth ended in March 2019. And, due to the previous blunders, I am out of work for the time being. A word for the wise: if you are considering traveling as a line of work, be prepared for situations like this and always have a backup plan. For me, I figure with every loss, comes the chance for something new. I must confess, I can say this because I have a husband who can support me when times get tough. Not everyone has this luxury. However, in the staffing agency circuit, news of a provider’s availability travels fast. I’m not sure how that works but they all seem to know when to call. I received calls from several staffing agencies with possible assignments in Fairbanks, AK, Concord, NH, Littleton, NH and several positions in New York. At first, I thought, Littleton, NH was a good option. The staffing agency for Littleton seemed to think I was the “perfect” fit and even called my references. However, I was denied that particular assignment because, although I have worked independently, I don’t have extensive experience in peripheral blocks (I’ve done blocks, just not that many – a subjective call on my part). This was an all CRNA anesthesia group and they had no interest in “training” CRNAs to do blocks their way. Although I am confident in my own skill set, they are not. I recommend avoiding situations like this, since it may lead to licensing issues down the road. Better to be safe than sorry. Finally, I decided to go to Alaska and work as an independent contractor. This would be a good opportunity to use my business without the “interference” of a staffing agency. I would have to prepare my own contract and work directly with the credentialing office to get my paperwork approved. I would need to arrange all my own travel and living. There most likely would be unforeseen costs to account for and plan for in future assignments. But I would be home and free to work as needed. I figured it was time. Time to go home and regroup. I believe all the assignment flip flopping of the past may have led me right where I needed to go, back to my roots, back to why I chose to travel in the first place. Today I am in beautiful New England, where the snow is falling creating a world of white. New England is where I grew up, my original home. However, my assignment is coming to an end and a new adventure about to begin. The start of my next assignment has taken a rocky road. I was originally scheduled to go to Columbus, GA. However, getting my GA RN license proved far more difficult than expected and since it took so long to get it, the site cancelled their offer. This was a first. But also demonstrates the risks involved in locum’s work. The ‘fine print’ not often disclosed by recruiters from staffing agencies. I’m lucky I have a wonderful, understanding husband who I can always fall back on if I need to. Amazingly, however, these things always seem to work themselves out. I’ve been given another opportunity in southern NH. It will take some re-organizing, but it is doable and may even be fun! How do I handle the stress? By letting go of the things I have no control over, by enjoying the opportunities that do come my way and by having faith everything will work itself out. In truth my website helps me keep things in perspective. I know I do good work. However, this past experience has made me question the hurdles placed upon practitioners by Licensing “Analysts” and Credentialing “Specialists”. Why do they have so much power in deciding our job opportunities? The GA BON Licensing Analyst complained about how my staffing agency neglected to fill out the “Verification of Employment” form correctly. She said, and I quote “How do I know you are not working as a plumber for the hospital and not a CRNA?”. The process was delayed three months because of a single form (in a multiple form application). Although this was the first assignment cancellation due to the delays I’ve experienced, it is not the first time ‘specialists’ have delayed my paperwork. Delayed Credentialing is one of the fears about working as a traveler CRNA. There is unfortunately, no recourse or some way to hold people accountable for their actions in causing the delay and the resulting staffing shortage. I have found it to be one of the most frustrating aspects of this line of work. And why? For what purpose? Do the benefits of credentialing outweigh the risks of shortages in staffing? I’d put money on a study proving otherwise! I don’t have these answers. But I do know, if we don’t address the issue, it will never change.